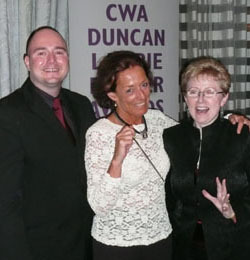 CRIMESQUAD.COM was delighted to be invited to the CWA Dagger Awards presentation dinner by our friends at Quercus publishing. Now in their third year sponsored by Duncan Lawrie Bank the CWA awards are slowly but surely starting to establish themselves as 'serious' and - with a top prize of £20,000 - are among the richest in crime fiction worldwide. The main Duncan Lawrie Dagger for the best crime novel of the year was a very popular choice in the room when it was presented by Peter Ostacchini, Deputy Managing Director of Duncan Lawrie, to Frances Fyfield for her book Blood From Stone. Clearly thrilled and emotional, Frances Fyfield thanked the CWA and sponsors along with her publishers, Sphere, and editor, Hillary Hale. Our picture shows (l-r) CRIMESQUAD.COM Online Editor, Chris Simmons, Frances Fyfield and CWA Dagger Liaison Officer, Margaret Murphy.